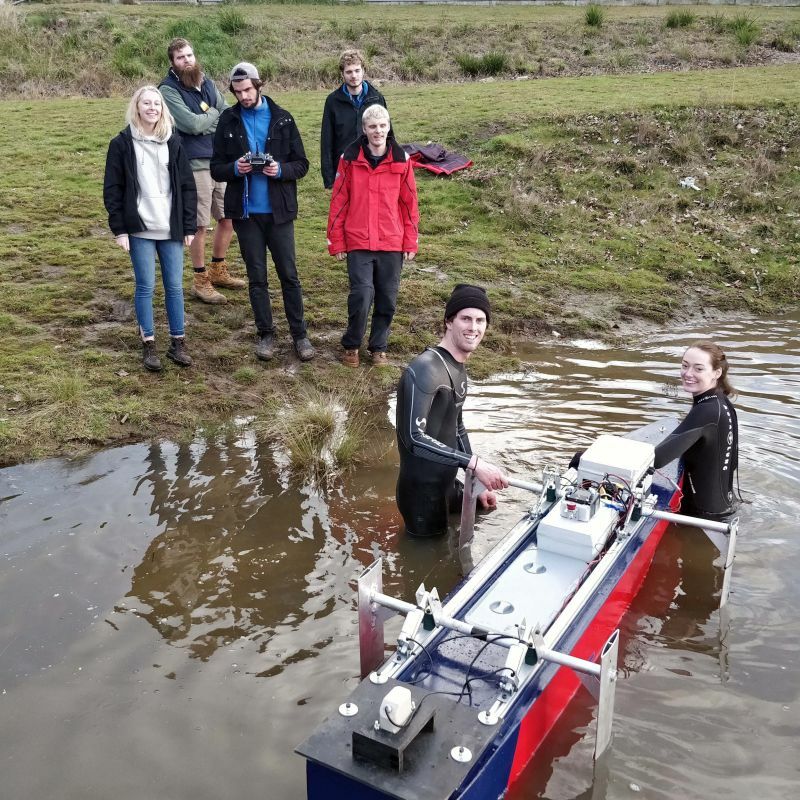 A team of maritime engineering students have tested their fast boat designs for the final time in Tasmanian waters before preparing to ship them to France to race in an international competition. The AMC Autonomous Technologies Society (AMCAT) crew will compete against 32 teams from 15 nationalities in the 2018 HYDROcontest – an annual competition that challenges young engineers from around the world to design and build the fastest and most energy efficient boat. Students have several months to design and build their boats before racing over a set course in the historic harbour of Saint-Tropez, France, from 2 – 9 September. The teams compete in two categories: the mass transport category in which each vessel must hold 200kg of ballast to simulate the displacement of a cargo vessel, and the private boats category in which prototypes loaded with 20kg represent leisure boats. Team AMCAT are entering both categories and have put the two boats through their final paces in the lake at Launceston’s Blackstone Park to assess their speed, manoeuvrability, stability and righting capabilities. Team spokesperson Maggie Gilligan said it was the second time the boats had completed “sea trials”, with earlier testing in Lake Trevallyn also providing vital feedback about their performance. We’re happy with where we’re at in terms of preparation, following about four months of work developing our concepts and testing and validating the two designs. “The testing went well with the heavyweight vessel reaching a maximum speed of 6 knots, but unfortunately its stability is continuing to be problematic. We’ll attempt to correct this by altering the hydrofoils over the next two days before it’s packed up to send to France,” Maggie said. The team’s mass transport category entry is a hydrofoil-assisted monohull capable of displacing the 200kg of cargo. A hydrofoiling catamaran has been entered for the private boat category, with team member Mattison McGelling dedicating his final-year thesis to investigating the optimisation of the hydrofoils for this vessel. The vessels are made from composite materials, one being carbon fibre and the other a fibreglass skin with foam core. Both boats have custom engineered propellers that the students made with AMC’s 3D printing facilities. All boat designs must meet strict entry requirements and are not allowed to exceed the maximum dimensions of 2.5 x 2.5 x 2 metres. The team would like to thank their sponsors: University of Tasmania, Australian Maritime College, Beca, Fibreglass Shop, Austal Ships, AMC Student Association, Foamland Launceston and OzWind Engineering. Keep up-to-date with their progress via the AMCAT facebook page. 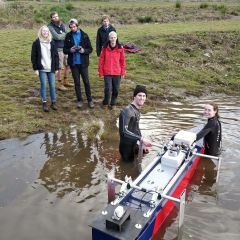 (Photo): Preparing the heavyweight vessel for testing are AMCAT team members (on land) Maggie-Rose Gilligan, Sam Tolman, Mattison McGellin, Chiel Tissink and Nicholas Seton; (in water) Isaac Probert- Water and Julia Blackman.